New York City Archives - TMRnyc - Total Metal Resource, Inc. Converting an old warehouse into lofts? One of the coolest parts of your new project could also be the least expected: custom metal fabrication. Working with a custom metal fabricator as you move from the concept and planning stages all the way through design, fabrication, and installation can be an exciting experience, whether your project is for your own private home or for a client’s commercial space. For interior architects and interior designers, there is nothing quite like creating a space that goes beyond a client’s expectations or taking a blank space and molding it to reflect the look, feel, and style a client wants. One of the most dramatic ways to accomplish this level of individuality in a space is through including custom-designed and custom-fabricated elements, be they decorative, functional, or both. 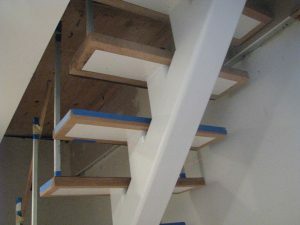 Why build a closed, wooden staircase when you can work with a custom metal fabricator and create the illusion of floating steps with a steel mono-stringer staircase? Why buy mass-produced tables at a design warehouse when you can create focal points that also demonstrate your client’s dedication to conscious consumerism by instead choosing locally handcrafted, stylish steel tables made of upcycled metal scrap? 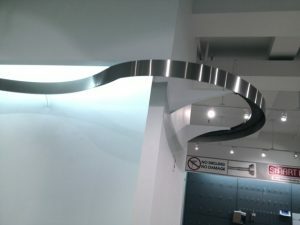 By working with a custom metal fabricator, you can turn an ordinary space into a canvas for a truly unique design. TMRnyc works with professionals and private parties alike to create every type of custom-fabricated metal furnishing imaginable. Whether you’re looking for a one-of-a-kind bar for a client’s new restaurant or the perfect accent piece for your power office, we’ll work with you to craft exactly what you’re picturing. Contact TMRnyc today for a consultation! Sticky: Total Metal Resource in the NY Times! If you’ve been out and about in NYC recently, you may have noticed the TMRnyc van rolling around. Sometimes people seem a bit surprised to see us motoring around the city so much, especially considering we’re custom metal fabricators and people often assume we pretty much live in the shop. Nothing could be further from the truth. Total Metal Resource NYC is a custom metal fabrication company, but we’re also an architectural metalwork firm. The difference? We don’t just make incredible custom metal furnishings. We install them. We build to our clients’ most exacting specifications from highly detailed shop drawings, and then we transport and install their custom designs wherever they need to go. We see each project through from concept to cleanup because we are more than metal fabricators. Installations are as much a part of what we do as any of our metalworking fabrication processes. Need entirely new hanging window baskets built into your retrofitted brownstone? We’ll build it, and then we’ll safely transport and securely install it. Beyond installing our own work, we actually tackle emergencies and installations of third-party products. So, if your oversized, thousand-pound antique mirror wasn’t properly anchored to the wall, you can call us and expect to see the TMRnyc van come rolling up STAT. Have a massive piece of artwork you need lifted through a window and into a third-story room for proper installation? Yeah, we do that. And that’s what the van’s for. Have you seen us around town? Snap a pic and post it to our Facebook wall! Or Tweet us! We want to hear from you, and we’ll let you know what we were up to! 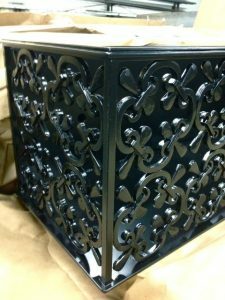 Contact TMRnyc at 718-384-7818 to discuss your next custom metal project. Brooklyn is home base to the custom metal fabrication team at TMRnyc, so any time we get a chance to beautify the neighborhood, we’re pretty excited. Enter our latest project, a brownstone renovation in NYC’s historic Park Slope area. 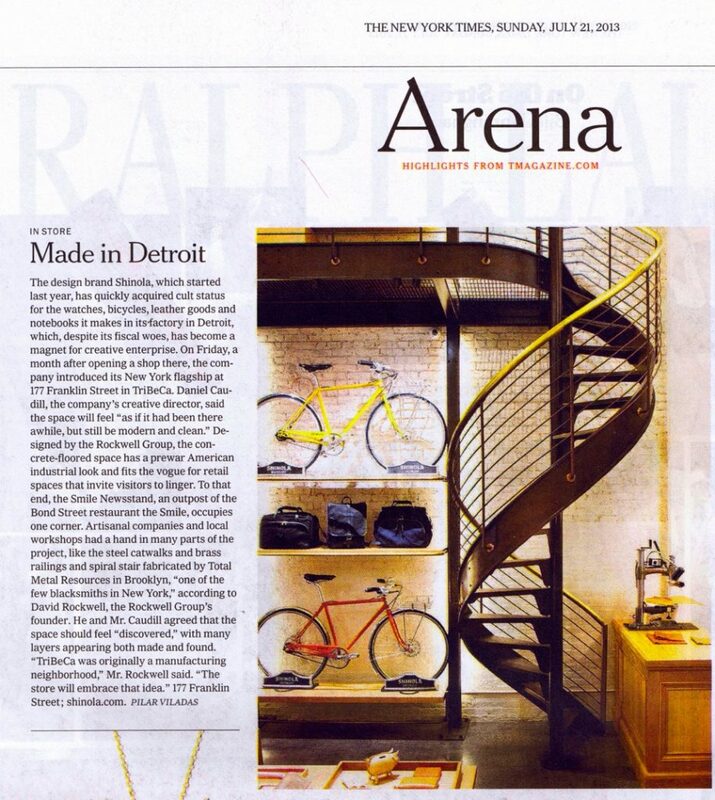 Says TMRnyc’s Scott Behr, “This multi-million dollar renovation project has us busy with a custom metal gate and these window baskets which are pretty awesome.” Awesome is right. Check out the pictures Scott snapped during the installation. Custom metal fabrication has a lot of elements, and every project brings a new challenge to the table with different skill sets coming into play. Fortunately, TMRnyc is ready for whatever comes up. With blacksmiths, glass workers, mold makers, engineers, designers, and other experts on the TMRnyc team, switching between processes during concurrent projects isn’t a challenge; it’s just part of what we do. Whether you’re dreaming of beautifying a brownstone or adding some luxury to your loft, TMRnyc has the skills and knowledge to work with you from concept through installation to bring your vision into reality. What do your dreams look like? Even if you don’t know the Maytex brand name, odds are you’ve seen their innovative yet beautiful products. Makers of all sorts of shower and window curtains, slipcovers, table covers, and more, Maytex is a global organization with worldwide distribution centers. Recently, TMRnyc was called in to do some custom metal fabrication and installation for Maytex’s NYC shower curtain showroom where they display their items for buyers from Walmart and other large retailers. Now, we’ve done some different projects here at TMRnyc, but a custom metal installation to give a room filled with shower curtains a flowing, sculptural feel a la minimalist American sculptor Richard Serra was definitely something new. Meeting a client’s budget is a major factor, of course. But for Behr, being able to do everything, from concept through installation, is truly what separates TMRnyc from the pack. Taking each project through installation ensures that the project ultimately matches up with the client’s expectations and the designer’s concept.